Specially designed fish cleaning stations with aerated minnow tank. Hand fuel pumps for filling small boat tanks. Dependable Volvo I/O engine for power. All bedding, linens and towels supplied. TV, VCR and DVD Player, AM/FM CD Player. Upper and lower helm steering on all boats. VHF radio and phone with unlimited free calling to the US and Canada. Refrigerator with freezer and or under the counter freezer. Fold down steps at front for easy boarding access to shore. Boarding ladders at back of boat. Stairs to upper decks on all boats. Picnic Tables and deck chairs on all upper. TV and VCR, AM/FM CD Player. 19 cu, ft. refigerator and freezer. Fold down steps for easy access to shore. Stairs to upper decks. Picnic Tables and deck chairs on all upper decks. Sat. to Sat. or Sun. to Sun. 19 cu. ft. refrigeraotr/freezer and a 8 cu. ft. refrigerator freezer. 9 cu. ft. regrigerator/freezer and a 6 cu. ft. freezer. 19 cu. ft. refrigerator/freezer and a 9 cu. ft. refrigerator/freezer. Maximum number of people allowed is 14. 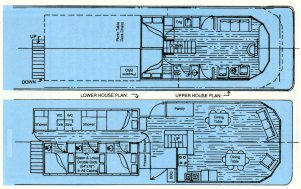 The boat has 12 double beds in six separate sleeping areas, 2 sofa beds, 2 1/2 bathrooms, 2 1/2 fridges, chest freezer, 120V generator, full size kitchen and appliances, dishwasher, microwave, 2 barbecues, water slide and powered by twin 120 H.P. Volvo I/O engines. 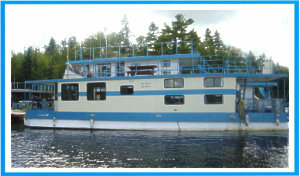 - One 16' boat is included for fishing and exploring. These have 2 padded seats with back rests. Dip nets, bait buckets, paddles, life jackets are supplied. Bring your own motor or rent one from us. -Extra gas tanks can be supplied for personal boats. Use the fuel, pay for it - if not, just return the fuel or any portion thereof. All boats from 3 p.m. or earlier on check-in day (start of trip) to 8:30 a.m. check-out day (end of trip). 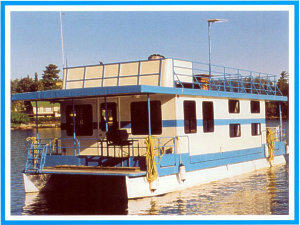 If rental starts on for example, Saturday, the houseboat might be ready as early as 10:00 a.m. or as late as 3:00 p.m. 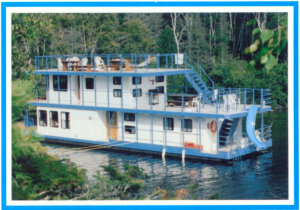 The houseboat must be back to the base no later than 8:30 a.m. the following Saturday. Postage from the U.S. to Canada requires additional postage. These are the Final Prices! There are no extras or surprises added on. The only extra charge is for fuel used - usually about $150 for most boats and about $250 for the 60'. 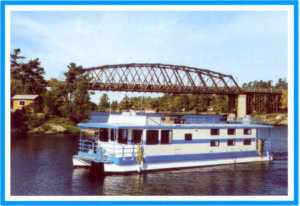 Included in the pricing are all taxes, insurance, generators, all bedding, linens and towels, TV and VCR, one 16' boat and fish cleaning stations. Insurance included in the price is a $500 deductible. Small boats and motors rented from us are included in the insurance.